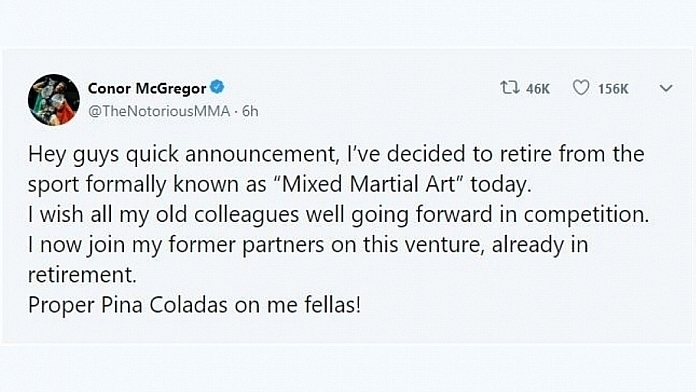 If you recall, Conor McGregor did announce his retirement back in 2016 and we know how that panned out. His fans are still trying to figure out if this is just another stunt the UFC champion is pulling and based on the reactions of many, one has to wonder. Conor McGregor appears to announce a surprise retirement from MMA – after telling @JimmyFallon on Monday's episode of @FallonTonight that he was in talks for a July fight. doubt this one will get the same attention as the "Thanks for the cheese. Catch ya's later." tweet from April 2016. I'm not quite sure if I'm convinced yet, but at the same time I wouldn't be too surprised. Time will tell if we have truly seen the last of Conor McGregor in the octagon.